This is what our New Year's Day supper looked like. It tasted even better than it looks. I wish I could have shared some with you, but I will share our recipe instead, if you are interested. It's very easy to make. We had purchased the lobster meat frozen at our local farmers market for $10.00 and it was all claws and knuckle meat only. We got the scallops there, too. It was perfect meal to end a perfect first day in 2010. In large stockpot, cook bacon until crisp; remove from pan, drain on paper towels, and set aside. In drippings, place scallops and cook for 3-4 minutes until opaque. Remove scallops from pot and set aside. In drippings in pot, add onion, potatoes and celery and cook for 3-4 minutes. Add stock and bring to a boil; reduce heat, cover, and simmer for 8-10 minutes until potatoes are tender. In medium bowl, combine flour, marjoram, pepper, milk, cream and mix with wire whisk until blended. Add to pot along with corn and bacon and bring to a simmer. Cook over medium heat for 12 minutes, stirring often, until soup has thickened and vegetables are tender. 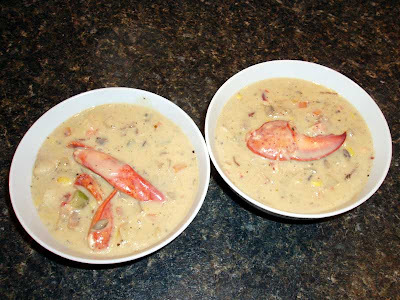 Add cooked scallops, lobster and shrimp and simmer for 3-4 minutes until the seafood is thoroughly heated. Adapted from recipe found here. Your recipe is quite different than my mom's... hers is heavy heavy on the cream and just onions, celery and carrots, plus the seafood of course. I'm sure the bacon adds LOTS of flavor. I've got some bacon i need to fry up, and now i'm wishing i had scallops to go with. Promised myself i'd eat from the pantry as much as possible, though.